The Occasional Review: Thirteen Ways of Looking at a Black Man, by Henry Louis Gates, Jr.
Thirteen Ways of Looking at a Black Man, by Henry Louis Gates, Jr.
A few weeks ago, I googled Anatole Broyard. I remember reading that he was the basis for Coleman Silk in The Human Stain -- a book I liked a lot -- and was curious about his life. 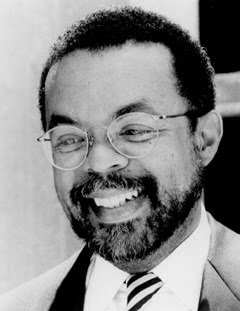 I happened to come across a lengthy piece about him by Henry Louis Gates. I was enthralled, and a few days later I checked Gates's book of essays out of the library. The collection consists of eight biographical sketches of different black men, written mainly for The New Yorker: James Baldwin, Albert Murray, Bill Jones (a dancer and choreographer), Colin Powell, Louis Farrakhan, Harry Belafonte, and Broyard. There is also a piece on the O.J. Simpson trial. Why the "thirteen" in the title? I certainly didn't spot thirteen different ways of looking enumerated in the book, so I suppose Gates just wanted to allude to the Wallace Stevens poem. I distrust the rhetoric of crisis. It's at once too gloomy and too hopeful: the Hippocratic trope of "crisis" invokes a turning point, beyond which lies recovery or death, and neither one seems in the cards for us. I have my doubts, too, about the way the ostensible subject of the crisis, the black male, has been conceptualized. It's a conversation that still bears traces (though fading ones) of a rivalry over victim status: the sort of Oppression Sweepstakes that ran through so much harebrained attitudinizing of the seventies and eighties. Politics, it sometimes seems, is what Belafonte did instead of the more wholesome, more normal preoccupations of the American superstar--namely, drugs, debauchery, and dissipation. On some level, surely, we want our idols to engage in the sins of the flesh--on our behalf, as it were--and, being obliging souls, they usually do. By contrast, the celebrity who makes heavy weather of his political convictions strikes us (when they are not our convictions) as recklessly indulgent: what's violated is the intricate, unwritten covenant between celebrities and their fans. We elevate them to godlike status, but heaven forbid they should think they're better than us. The professor is still very much in evidence here, but this is real writing. Gates duplicates some of the virtues and flaws of Edmund Wilson, one of my favorite writers of biographical sketches: the stately prose, the ability to disappear at some points into the material, and also the tendency to go off the rails when left alone with ideas (see for example Wilson's terrible introduction to Patriotic Gore, his great book on the Civil War). Sidney Poitier, who is Belafonte's best friend and nearly exact contemporary, says that the childhood years they spent in the West Indies gave them a psychological advantage: colonialism aside, growing up in a black-majority country meant that most of the doctors, nurses, lawyers, and policemen you encountered were black. "I firmly believe," Poitier said, "that we both had the opportunity to arrive at the formation of a sense of ourselves without have it fucked with by racism as it existed in the United States." Sidney Poitier curses! Who knew? Anyway, I could quote and quote. Thirteen Ways is not flawless, but it is has given me more to think about than most other books I have read recently. And also more to discover: I have a whole list of titles that Gates has made me want to read (Baldwin's essays in particular). I was going to write some commonplace about how this book transcends issues of race, but this seemed like a weirdly belittling compliment; race is still a massive enough issue in American life to be quite worthy of everyone's attention with no transcending required. I recommend at least taking a look at the Broyard, Belafonte, and Powell pieces -- they are very worth your time.